Note: Outlier provided this shirt for review purposes. The Outlier Albini Merino Broadcloth Hidden Placket shirt is a mouthful, and perhaps the most luxurious 100% merino shirt you can buy right now. It’s made from a very fine material which doesn’t feel or look like any other wool shirt on the market. This is a 100% merino wool shirt, but to stop there would be disingenuous to this shirt. Outlier’s detailing of the fabric is: Made with Albini Merino Broadcloth, 100% Super 140s, 16.5 micron merino fabric, 130gsm, woven in Italy. If, like me, that’s a pretty confusing statement for you, then let me break that down a little more. The ‘Albini’ portion of the naming (the ‘A’ in ‘AMB’) is representative of the Albini Group in Bergamo, Italy who wove the shirting material. The material itself is 100% 16.5 micron merino wool — a very fine micron to use for shirting of this type. The Super 140s refers to the fineness of the material, and since I am quickly getting out of my depth I will say that means the material is made of very fine strands of wool. The broadcloth, is the type of weave which is seen as dense and soft. Now, let me translate all of this for you, assuming you still are a little unsure about what all this means. First, this is a 100% merino wool shirt, and it is made with a very fine merino wool strand — this leads to a very soft and luxurious wool. 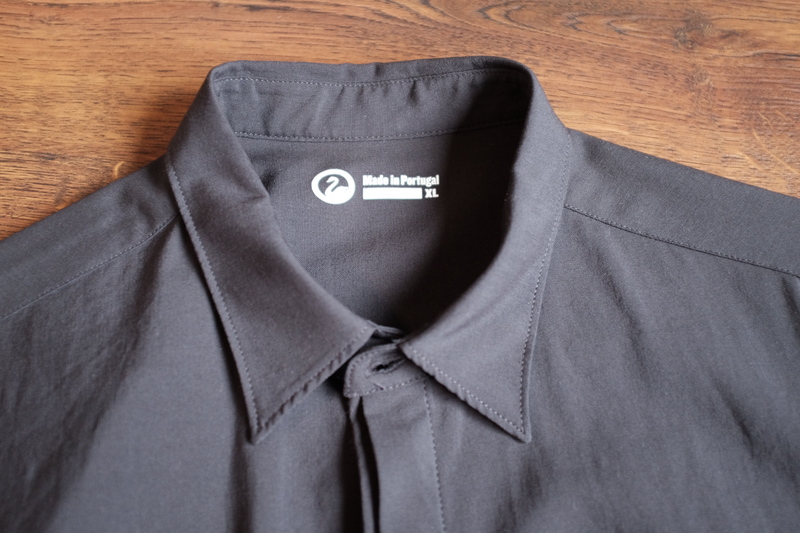 The weave of this shirt, means that it lays down very flat and looks very fine. Further, it is light in weight at just 130 gsm — it’s thin. Translating this further: this shirt is closer to my white button up dress shirts (my cotton ones) than it is to any other wool or synthetic shirt that I own. The hand feel is smooth, more so than soft, and the drape is a not nearly as rigid as most merino shirts, and especially less so than cotton. It doesn’t ‘stand’ on it’s own, so gravity will always be guiding it. Overall, it’s actually quite a unique and impressive fabric. The cut of the shirt is excellent, and when you combine that with the natural drape of the material it feels great. From a comfort perspective not only do you get the great merino wool properties, but there is subtle give in the shirting, and the thinness of the shirt really makes it quite comfortable to wear even in warm weather. Overall, I have nothing bad to say about the fit or comfort of the shirt — top marks. 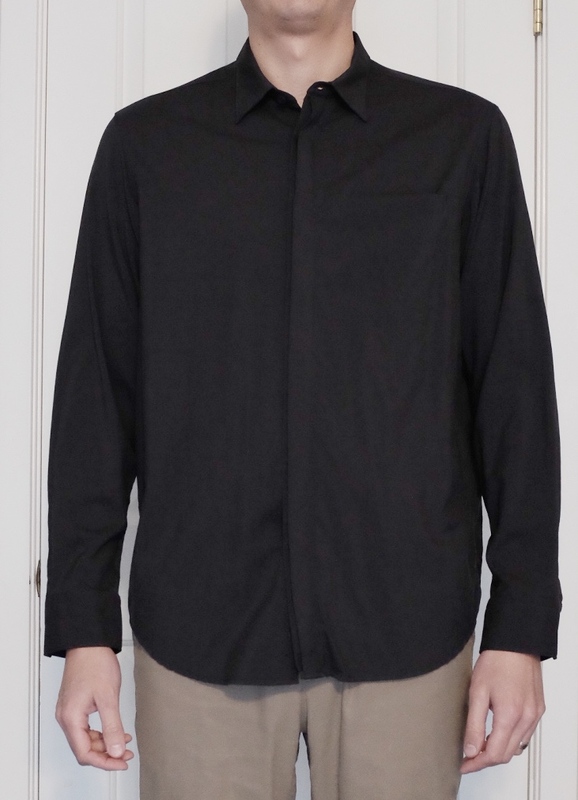 Outlier offers this shirting material in two styles: button-up, and hidden placket. They are wildly different looks. 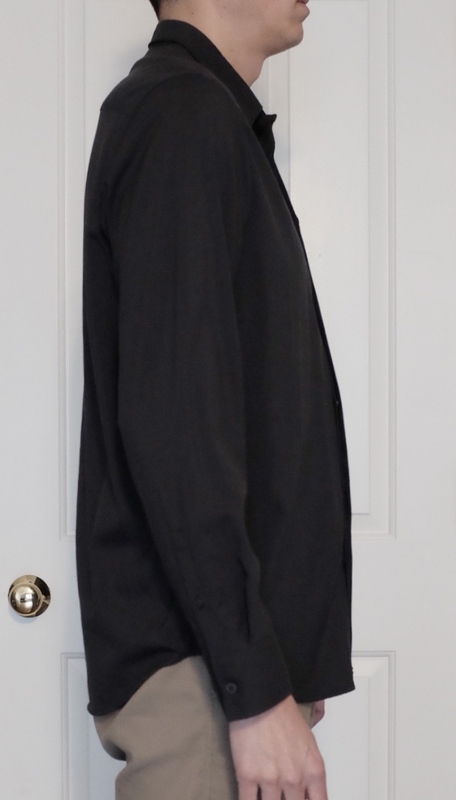 The button-up could likely easily be worn into the office, the hidden placket — which I chose for this review — is another beast entirely. 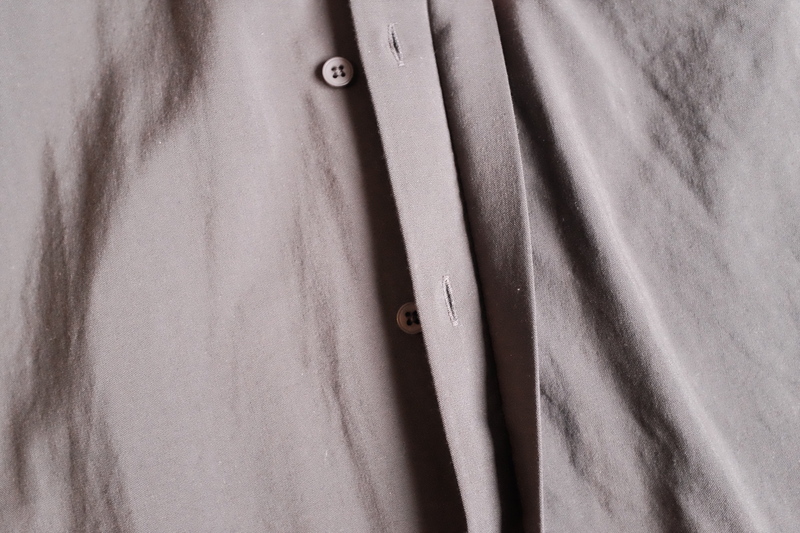 What’s hidden is the buttons on the front, as they have an extra flap of material that sits over the top of them — some might be familiar with this look from more formal shirting. 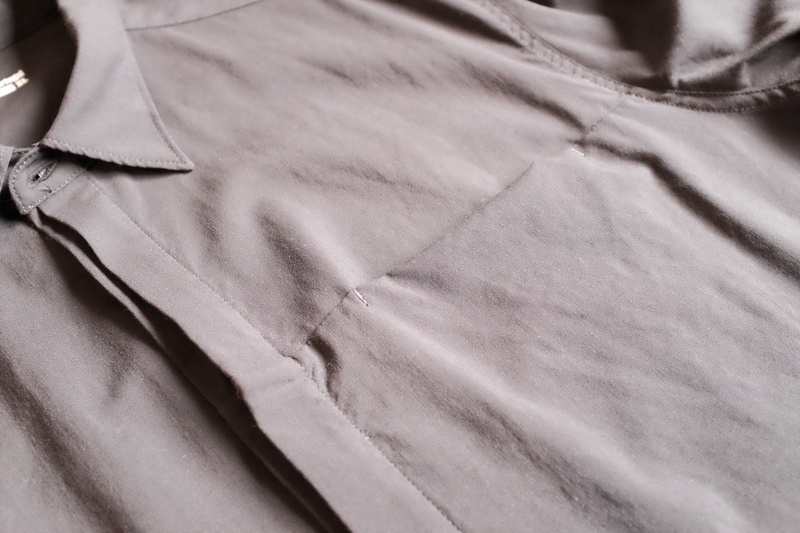 Additionally, this shirt has a front pocket that is a slash pocket — which means instead of it being a more traditional swatch of material sewn on to the face — there’s a slit at the top, and a pouch on the inside of the shirt to make up the pocket. It also seems as though the collars are slightly different between the two shirts, with the hidden placket having a shorter collar. I personally like the style — it’s a little odd and not something I would typically pick, but I think it is for that very reason I like it. My wife, on the other hand, isn’t the biggest fan of the style. This is one of those: it looks like the pictures, so if you like the pictures then you’ll like the shirt — cases. 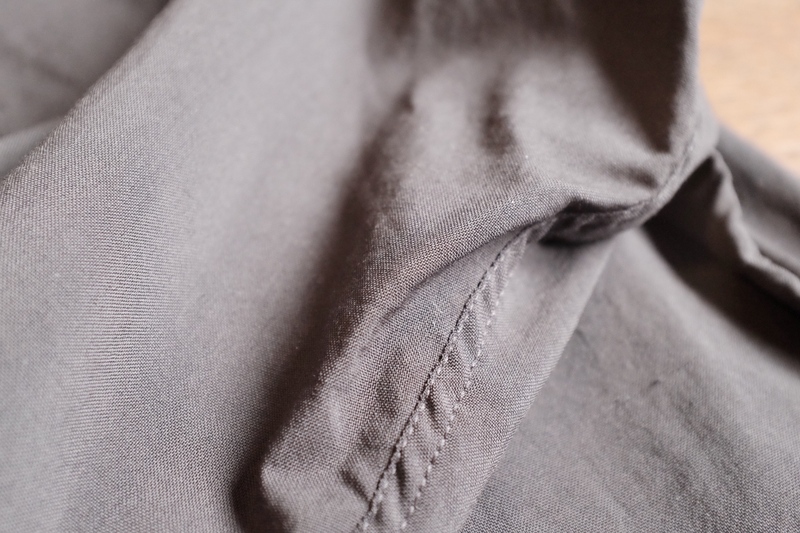 I have noticed that people often ask about the durability of the shirt — likely because it feels so fine and thin, people assume it is not durable. As you might know from my other reviews I have an older top-loading washing machine with an agitator. I washed the shirt in that — no issues. Further, I think this shirt is more durable than at first glance — though I certainly won’t want to wear it with a rough GORUCK style backpack. If worn and used as a dress shirt, or without a backpack, there should be no problems at all. This shirt is among the more luxurious shirts I own — not only from a comfort perspective but from the overall look and feel of the cloth itself. It is thinner than expected, but more substantial than other ‘thin’ feeling wool shirts I have experienced. This particular shirt lends itself to more casual wear, whereas the ‘button-up’ variant would blend better in the office. Either style you chose, the material is likely not like anything you have felt before, and feels incredibly high quality. I love the fabric, the cut, the comfort, and really the entire shirt. You do pay for this level of quality though, which is reflected in the $225 price tag. I don’t think most will fill the entire closet with these shirts, but many of us surely would like to fill them with this shirt. It is quite special.